So this is it. Our EnduroKA racer is ready to rock and roll. 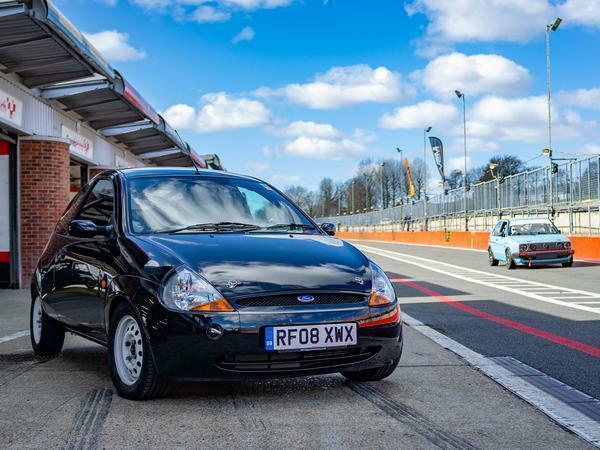 After its very (very) swift conversion from shopping trolley to racing car, we treated our white-wheeled machine to an open track day at Brands Hatch - precisely the kind which features cars with five times the power, big wings and semi slicks. Were we worried? Well, yes. Until recently Black Force One had known nothing more strenuous than a trip to the Co-op and back. And there's nothing like a proper pitlane to make a supermini look absolutely out of its depth. But once you're strapped in, gripping a suede wheel with a racing helmet on your head, even a humble KA is liable to feel the business. And so it proved. 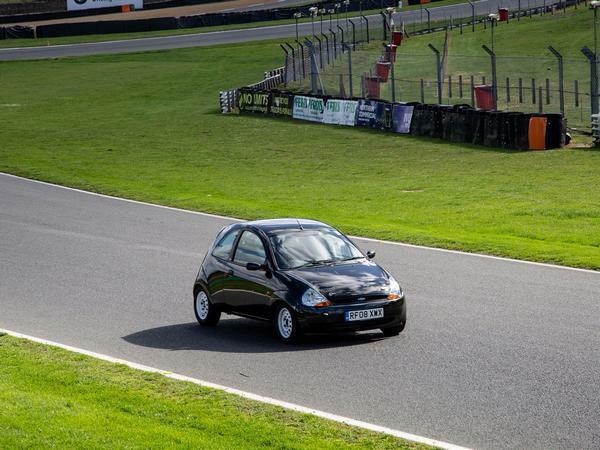 Try dwelling on the car's humble origins when you're charging into Paddock Hill Bend as quickly as your sense will allow. Undeniably, it is quiet (it recorded 79 decibels in the morning sound test), its dinky four-pot made to seem all the more so by the close proximity of proper track day machines. But it is keen and revs to 5,000rpm with growing eagerness, and on the approach to Brands' daunting first bend it feels genuinely alive. There's not much speed to scrub off so the corner is negotiated with an extended dab of the brakes, but that helps get the nose in because the KA goes lovely and light on its hind legs. Kudos to Ben and Olly for doing most of the chassis work, because the KA not only feels agile, but also composed on its new Bilstein springs and dampers. You can, of course, over rotate the rear end and bog the engine, but encourage enough back end slip to have the car pointing at an apex and then it's all throttle. And momentum. As we suspected, clearly this year is going to be about maintaining a high average speed rather than attacking kerbs and lobbing the car around. But this endurance racing so that's fine - and, come Saturday, it'll only be other KAs that we have to compare ourselves with. Mid week, there were four of us - Ben, Olly, Pete and yours truly - on hand to drive, and despite vast differences in experience, everyone managed to settle in and (after no time at all) start taking some real pleasure from wringing every last naturally aspirated horse from the 1.3-litre motor. 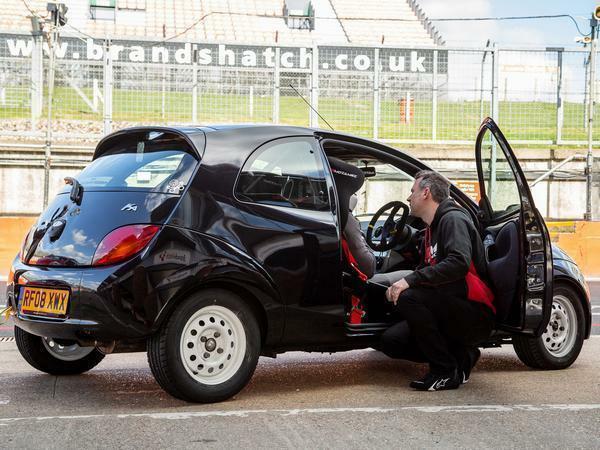 Truthfully, with its ultra-tight polybushed chassis and hydraulic steering feedback, the KA is so communicative that it took little more than a lap for it to start feeling familiar - familiar enough to start cocking a wheel over the inside kerb of Surtees, at any rate. All of which means that we can decree the car's first test a successful one. Which is chuffin' useful because obviously this weekend heralds the official start of the EnduroKA season. To say we're excited is something of an understatement. It's a wonder we've got anything else done. And with at least 20 entries due at Donington Park the pressure is most certainly on. But if Brands is anything to go by, it ought to be giggle, too. If you fancy coming along on Saturday and joining in the merriment - even in a pointing-and-laughing capacity - full details on the race weekend are available here. There'll be a bunch of Radicals and Formula 3 cars to provide noisy (and much quicker) support ahead of our race start at 13:55. 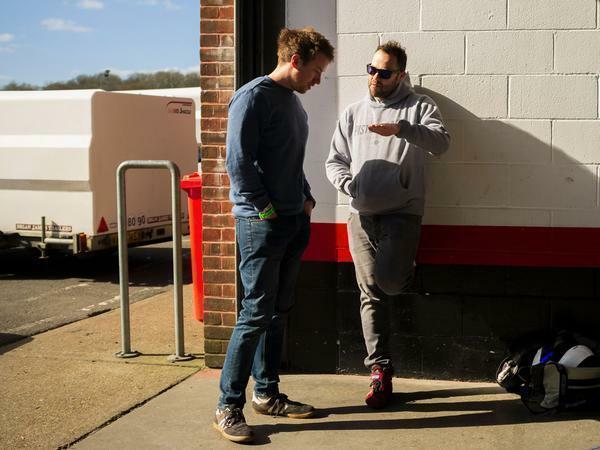 Alternatively, if you prefer a little more structure to your free time, we'll be holding a Sunday Service at the next race at Snetterton on 16th June - so keep your eyes peeled for more on that soon. Thanks to MSVT for having us along on the track day! Great read and good luck. They are cracking little cars. Great project. But seriously how does it taste? Is the flat-bottom wheel a control item or do you have a really, really tall driver you need to accommodate? You should seriously look at de-powering the steering rack. Ditching the PAS on my MX-5 made the engine feel considerably more eager - you might find losing the parasitic losses has the same benefit on the Ka. 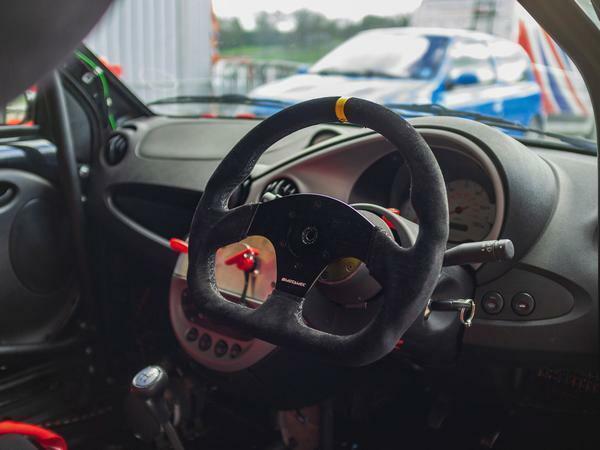 As for steering weight, it's a Ka on narrow control tyres... plus you'll be travelling at racing speeds so it won't be particularly heavy. You may even find the extra definition in the steering feel a benefit. 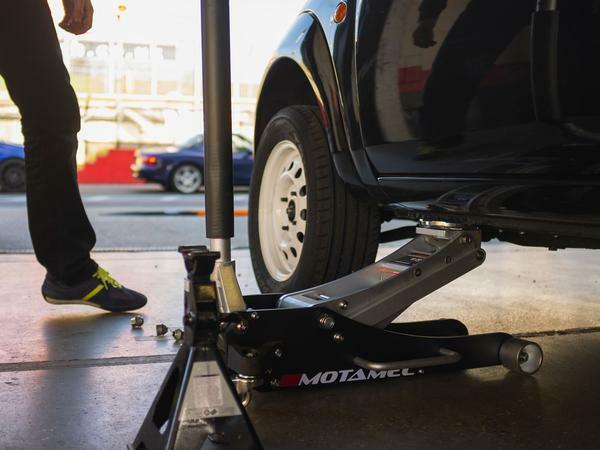 Although the MOT regs outlawed removing power steering a couple of years ago, you are still permitted to remove the power assistance if the car was available without it. 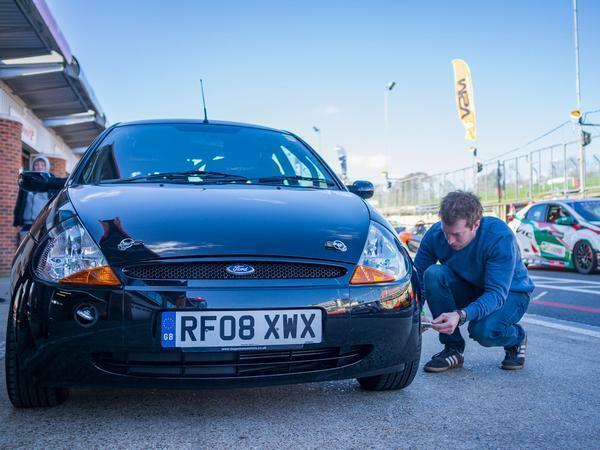 As the Ka was available without power steering it'll remain road legal, if that's an issue.